What makes residential care good? I was asked this morning on Twitter what I felt made a ‘good care’ in a residential home. Sometimes it’s hard to elaborate in 140 characters so thought it would be useful to explain my thoughts in a little longer form. I’ve worked in social care for a number of years, either as a care worker/support worker in a couple of residential homes (and as a ‘bank’ carer in even more) and as a social worker in adult and mental health services. I’ve been into a lot of residential care homes and I’ve seen massively varying standards from the home the time I left a home with such heavy concerns that I left a message for the CQC inspector on my way back to the office to the homes I would both be happy to live in myself and would be happy for any of my family members needing care to move into immediately. So how do I judge what is ‘good’ (and these aren’t necessarily in order!) – especially in the time limited fashion that often involves me walking in and out in an afternoon. Culture – which can be hard to quantify but you know it when you see it. From the decor and the welcome you receive when you walk in or when you call on the phone to the small interactions you might see in the lounge area and the amount and type of items you might see. Is the lounge empty except for a few paperbacks that look untouched and are mostly large saga-type romances with little variety? Are the (as there was in a home I went to earlier this week) lines of VHS videos stacked up next to the TV? (without a video recorder, incidently)? These things show care, or lack of it to the details. Feedback – I listen to people who use the services. Communication can be at different levels and there are sometimes people in care settings who don’t want to be there but often users respond to kindness and listening to the feedback of those who use the services and family/friends who visit is vital to understanding the quality of the service. Of course, it’s useful to read the official reports but they are so rare now and often out of date – while issues around quality of care can change quickly, that we need to look in other areas and understanding how well homes respond to individuals and their needs, wishes and wants is fundamental. Staff – How am I greeted, that’s one this but more importantly are the interactions I see between staff and residents and not necessarily the residents I’m there to visit. Is there eye contact, is there any touch involved? Are the staff sitting in the lounges responding in conversation rather than requesting things are done/not done? Is there any interaction between residents? How is this facilitated? What is the staff turnover like? I might ask the member of staff showing me round how long they have been working there, do they enjoy it? Often they’ll say yes, anyway, but sometimes you get a glimmer of something else. Size – I have an issue with stacking up older adults in large residential homes in a way that we wouldn’t in other user groups. We have residential and nursing homes now with 50+, 90+ residents. There can be good care in these places but are they ‘homely’? Are they able to meet individual needs? Or is it a hark back to institutionalisation and long stay hospital type settings. It feels like it is about cost and age discrimination. I would be happy to care delivered in small settings. Large doesn’t necessarily mean bad and small doesn’t necessarily mean good but do we really think there is a justification for 100 bed ‘units’ in the current day. The only justifications are cost and economies of scale. I don’t think that’s good enough. Individualised responses – are the residents individuals? Can they pursue different activities if they don’t want to sing music hall songs? What if I resident moves in who prefers Led Zeppelin to Knees up Mother Brown (real story, incidently!). What if they wanted to do things or go places that weren’t on the ‘programme’? Yes, individualisation can cost but it doesn’t need to – it can be able to things that don’t necessarily raise a charge. How is this done? I want examples in every home of how individual needs are met. Those are some of my initial thoughts. I’d welcome thoughts from others about what and how they make judgements about what good care in a residential setting involves. Thanks for Bill Mumford for inspiring me to write! Research in Practice for Adults (RiPfA) will shortly be launching a manifesto for adult social work. They were asking on Twitter for people to feedback using the #socialworkvalue hashtag to explain in 140 characters or less the value of social work. Being verbose, I couldn’t restrict myself to 140 characters. They are kindly hosting my thoughts here. It’s an interesting debate to be had so join in by leaving comments on that post or on Twitter by following @ripfa and/or using the #socialworkvalue tag with your thoughts. Today is the start of Dementia Awareness Week. The Alzheimer’s Society are running a campaign ‘Remember the Person’ which is a good byline, if only it could be remembered. In the wave of headlines talking of ‘dementia timebombs’ and ‘care crises’ its unsurprising that the presentation of ageing and dementias (although important to note that dementia is not a part of the ‘natural’ ageing process) is seen in negative lights and that ‘remembering the person’ is often the last thing that happens. 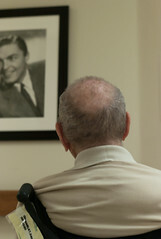 This is important generally, but it is particularly important in health and social care settings when all too often systems have been commissioned and organised for people who do not have dementia – and services are not making allowances for the additional time and skill needed to be able to give people who have dementias the dignity of improved communication and facilitated communication. While the Alzheimer’s Society concentrates on the ‘Remember the person’ in day to day life, I’d like to add my own ‘wish list’ to their campaign in terms of health and social care professionals, managers and commissioners and add a few pleas. -Remember that caring for someone with a dementia, whether at home, in hospital or in a residential setting, requires particular skills and commission appropriately. Time for training for staff and space and time to promote communication has to be built into commissioning costs. This cannot be done in 15 minute slots. It cannot be done by agencies that do not offer consistency of care. This is detrimental to the individual who is cared for and the family around them. – Remember to support the family and friends of those who care for people with dementia. Do not punish a family financially and through pulling back support because you are relying on their family because the more pressure that is put on family carers without support, the greater the costs in terms of longer term ill health and distress. Support doesn’t always have to have a high financial cost. It can be about support in other ways and linking in with carers services. They are there for a reason. –Remember that not everyone who has dementia has family or friends around to advocate for them or support them. When you roll out programmes like ‘personalisation’ and automatically assume that everyone wants ‘direct payments’ and deliver two tier qualities of service, they may (and currently do) exclude those who may not be able to manage the direct payments themselves and who don’t have family to advocate for them. There is an imperative to bring the voice of people who lack capacity to the agenda of ‘choice’. My own solution would be to build in the requirement for independent advocacy into the processes and into the budgets. We must demand better in terms of personal care delivery for all, but especially those who cannot or do not feel able to (due to power imbalances) speak up for themselves. – Remember that the person who is being cared for is not one of ‘the elderly’. They are a person and an individual who has loved and who has been loved. They are a person with aims, ambitions and goals. They might not be able to express them as well as in the past but having memory problems does not mean that someone necessary lacks capacity or communication skills – it can though, take more time – regard humanity as having worth. When we have to make decisions on behalf of others, remember to treat everyone as you would want to be treated but remember not everyone wants what you would want. – Remember not to dismiss or diminish those who have dementia. While, depending on the type of dementia ‘recovery’ can mean different things, what it absolutely does mean is not giving up hope and building on the strengths of those around. We have to think about living positively with dementia. Too often within social care and health services, I have seen other services discriminate against people with dementias and older people because they make assumptions which are dismissive. We should never make assumptions and never extinguish the hope of facilitating a better quality of life which build of the strengths of individuals. Never. Let’s hope that Dementia Awareness Week is successful and makes providers and commissioners dwell on the need for awareness of the issues of dementia, as well as the ‘general public’. Poverty pimps, old rope, and lemon soaked paper napkins – welcome to a post-legal aid world? The conference explored changes to the legal landscape, and therefore along the way the new LASPO Act, with its slashing of legal aid scope, and its new provisions regarding success fees and damages based agreements. Categorically and emphatically, I did not detect any kind of glee over a move from the former to the latter; but there was a certain resignation at the inevitability of it. Meanwhile, out here in the social media world, there have been the early rumblings of warnings that “benefits sharks” are back, people offering to help those with benefits problems, then ripping them off for a cut of the “winnings”. The warnings are exacerbated, of course, by the coincidence in time of the Welfare Reform Act 2012, which replaces Disability Living Allowance with Personal Independence Payments requiring 3.2 million claimants to be reassessed for the more restrictive benefit. These two pictures (resigned professionals or rip-off merchants) are completely different, but are they in fact looking at exactly the same phenomenon from two different angles? And if so, do I have any chance of trying to show each side the perspective of the other? Well, I’m going to try. And this is why. I imagine that there are many people like me, who have spent years advising on social welfare law under legal aid, who are wondering how on earth we can carry on helping people in a post-legal aid world. And a model that involved charging the successful has to be engaged with. This morning I came across a deeply depressing blog post entitled the non-exaggerated death of mental health social work. There simply isn’t going to be such a thing as mental health social work within a multidisciplinary team. Upset personally, terrified politically. This Biopsychosocial model we’d all worked towards collectively, the idea that a person existed within a socio-political context, that a person was created from events as well as biological material, the knowledge of different social roles, power-differentials within caring relationships, the question of meaning and identity, all of these are lost. While nursing staff have some training in these ideas, necessarily it is not the bread-and-butter of their training, nor should it be. No professional can be completely holistic in the true sense. That is why the multidisciplinary approach was conceived, and has been the backbone of Community Mental Health for over forty years. It has now been undone in a matter of months and there appears to be no reverse gear. This chimes in a nasty way with the sort of thing I’ve been noticing in my own neck of the woods. Relations between CAMHS and social services have historically been fairly poor. As the gulf widens, this relationship can only get worse. The risk is that it can turn into a game of pass-the-parcel with children. As soon as one service accepts responsibility for a child, the other service steps back…This isn’t spoken out loud, but there’s a sense if this trend continues we could move closer to an assumption that if a child is seeing CAMHS, they can’t have a social worker. And if they’re under the care of social services, they can’t have a service from CAMHS. This certainly seems to be continuing. All the social workers in our CAMHS team are being pulled out, just like the ones in the blog post I read today. It seems to be pretty much unofficial policy in both health and social care camps that we are not working together to safeguard children. Years of good practice about joined-up working between health and social care is being undone at a fast rate of knots, crushed beneath a merciless drive to control budgets. Health is now something that happens in one place, and social care somewhere else, and never the twain shall meet. It’s appalling. Andrew Lansley’s short speech at the RCN Congress this week did nothing to reassure the profession of nursing that they will have a long and happy relationship with him . While we all share the drive to provide good quality care the voice of the people who are providing the care continues to be ignored. It is easy to quote figures on care improvements but not so easy to talk about the huge loss of nursing posts as people get stressed from overwork and go off sick, burnout, retire or take voluntary redundancy schemes – disguised in any way you want. Resources ( I assume he means nurses here) must be at the front line but resources (aka nurses) are also the first ones to be hit by budget cuts, lack of or just poor quality equipment, and threatened with their jobs if they do not hit targets. While he is eager to quote figures on cost improvements he fails to tell us the costs that this leads to in the people trying to meet those targets. Nursing leadership he says will be able to address all these issues but leaders are not always managers and managers are not always leaders. We need to make this very clear. Giving nurses the title of leaders does not give them the power to do anything about it. Leadership does not obtain more staff or equipment, meet targets or reduce jobs – this is politics and there is a deliberate lack of politics in the nursing profession. Imagine if nurses were given the power to make changes in their workplace and how different would our NHS be if we were all a little bit more political? While most nurses go about their everyday business trying to ignore the pressures of politicians they are also ignoring the threat of extinction as they are quickly being replaced with unqualified staff, volunteers and even machines. When the last few nurses are still standing perhaps the politicians will begin to listen and give them the power to make the changes needed to keep our NHS alive. Today, the Guardian published an article about the inequitable costs of home care services throughout England and the shrinking of access to council-paid support for care in the home. The survey, seen by the Guardian, shows the average charge for an hour of home care has risen by 10% in the past two years – from £12.29 to £13.61. …there are wide disparities in the price people pay for care depending on their location. Home care, for example, is free in Tower Hamlets but costs £21.50 an hour in Brighton and Hove. The data show that fewer older people – in excess of 7,000 – had their care services fully paid for by a local authority in 2011 a reduction of 11% compared to 2009. This certainly reflects my experience in practice. There are a number of concerns that result from this report which merely confirms what everyone in the sector knows. – Eligibility criteria are moving upwards. If we look at the Fair Access to Care Services which are the supposed ‘standardised’ entry point to ‘care provision’ in local authorities – the lower ‘access’ point has moved higher. From moderate needs being ‘covered’ more local authorities are moving to only allowing ‘substantial’ or ‘critical’ needs to be covered. This moves a lot of the preventative work away from local authority provision. This has a significant impact on the manner which personal budgets are implemented. A lot of the leisure type activities we see as examples are being pushed out in favour of budgets which are strictly intended to meet immediate personal care needs. Options for choice are much more limited in this context, particularly if a person does not have support around them. This is something I’m seeing much more as my own council has increased the costs of care. More people whom I assess as needing care are refusing it or refusing discharge from hospital solely on the issue of cost of care. There may be an assumption that ‘working hard all my life’ means that social care provision will be free in the future but it’s very hard to argue the value of a personal budget at (for example) £10 per hour when the charge will be £10 per hour. It is counter-intuitive and yet by bypassing the local authority ‘processes’ there is potential support that can be lost in terms of assistance in recruitment of staff/tax related issues. We are forcing more ‘cash in hand’ work sourced via Gumtree or notes in the newsagent windows. This also means that people remain at home without the support if they do not wish to pay for it and the potential for much higher costs will come at a later point. Either through preventable or delayable hospital admissions or by admission to residential care sooner than might have otherwise been necessary. Seems obvious but I see it happening every day. We can’t ‘force’ care on anyone (putting the capacity issue aside for one moment) and if someone is adamant they don’t wish to pay for care which is assessed as being needed, we just sit on our collective hands and wait for things to deteriorate –by which case, it may be too late. – Personal budgets and the ‘personalisation’ agenda. I’ve mentioned some of the counterintuitive ways that services can cost as much as they are charged for – that’s particularly evident if we are considering a direct payment. There’s another problem with the implementation of the systems of ‘personalisation’ as they exist in reality. We were told initially it was intended to be a shift in ‘power’ from professional to user – which is fantastic – however the reality is often far from that. Assessment forms look similar (and ask similar questions in similar formats) to DLA application forms and focus heavily on physical rather than mental health needs. The RAS (resource allocation system) pushes these assessments through an accountancy system which is non-transparent and spits out an ‘indicative budget’ based on a number of often unknown factors. So you get more money according to lack of ability to do things which perpetuates a top down model which doesn’t build on strengths of what someone CAN do – rather what they CAN’T do. This process is convoluted and opaque. However well explained, sometimes people want good services delivered. Choice is only choice when it’s actually offers options. Seems obvious but it isn’t the reality. I am sad to say when I arrange support via a managed personal budget, I can’t necessarily guarantee quality of care to the user. We use agencies that have won their tenders for the contracts with the council purely on the basis of cost rather than quality. There may be carers rushing in and out on minimum wage without being paid travel time, between 30 min visits in disparate geographical locations. Is it any wonder that people are refusing these kinds of services when we can’t guarantee consistency or quality of support. There are some fantastic care workers. Really, they are gems but it can be hit and miss because the way that costs are being driven down mean the agencies cut costs at every moment. We aren’t delivering value for money. This shrinking of provisioned support for older adults and people with disabilities will lead to much higher long term care costs both with costs shifting to health care services as people are admitted sooner into hospitals and care costs as residential care becomes an option sooner. In some ways, more importantly, it will and does lead to a reduction in independence and quality of life which is much more important and can’t have a price put on it.